Will walking make your golf game better? I have held steady in my seven years in the golf bag business, that walking is the way to go. Now, please listen to what this doctor has to say. After all, it was my doctor who suggested I “get off my pockets and walk the courses”. Walking or riding a golf cart? Which option is most likely to help you play a better game of golf? Well, it seems that walking is the real key to a better golf game, and in more ways than one. For one, it improves rhythm and focus, because it allows you to think about and focus on your next shot. Golf carts are destructive little critters whose ability to damage a course is well known amongst green keepers and golf course maintenance personnel the world over. Golf carts chew up the rough and, even though they are banned from the traps and greens, wayward golfers often wreak havoc there as well. While you might think that rolling resistance of four tires would be far less damaging to today’s hearty grasses than the effects golf shoes and dragging heavy golf bags, you’d be wrong. That’s why so many courses restrict carts to marked paths only, and some courses have banned golf carts all together. Strengthening the heart muscle itself *Lowering blood pressure *Lowering bad cholesterol levels while raising good ones are greatly enhanced for those who walk. Golf requires the coordinated efforts of over twenty muscle groups to play the game, and each of those muscle groups will perform a lot better if they get the opportunity to walk along the course with you. Walking also increases your lung capacity which, in turn, delivers more oxygen to help your body produce more energy. Walking provides the additional “woo woo” benefit of allowing you to “become one with the course.” Forget the new age implications, there’s really something to this. Zipping around the course at golf cart speeds is like driving through a new area and staying on the interstate. Sure, you can say that you’ve “been there”, but did you really learn anything about the local sites and attractions? The same holds true for walking on the golf course. When every step you take puts you in actual contact with the course, you end up getting a much better feel for the peculiarities of the course including slops, rolls, bumps, water, wildlife, and other interesting items that commanding a golf cart would never let you see. So the next time your partner asks if you want to walk or ride, say “ride” and if they do not, whip out a copy of this article and show him or her why walking actually improves your golf game. Not only that it saves you money too! A sense of humor helps in most situations. Keep your chin up – or down when you are putting. Ha! 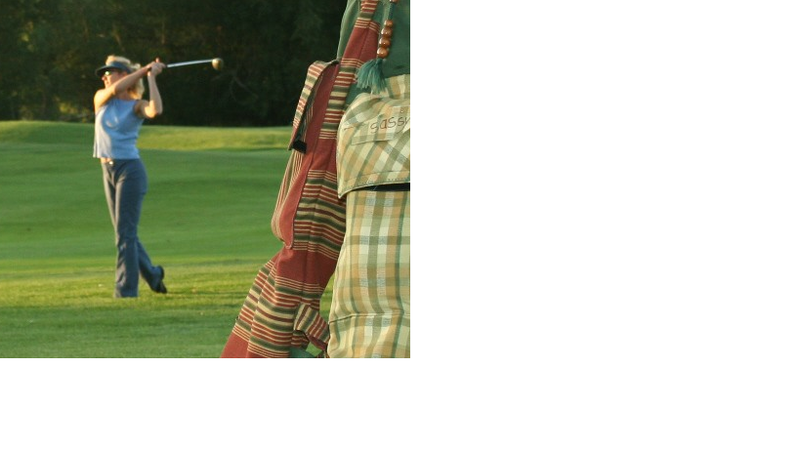 A big thank you to S. Brooks, who recently purchased our last Twiggy SASsy Golf Bag. Shipped it out to Fort Collins on Saturday, and looking to playing a round of golf with a new enthusiastic lady golfer! I’ll be looking you up Ms. Brooks! Thanks again for your business.